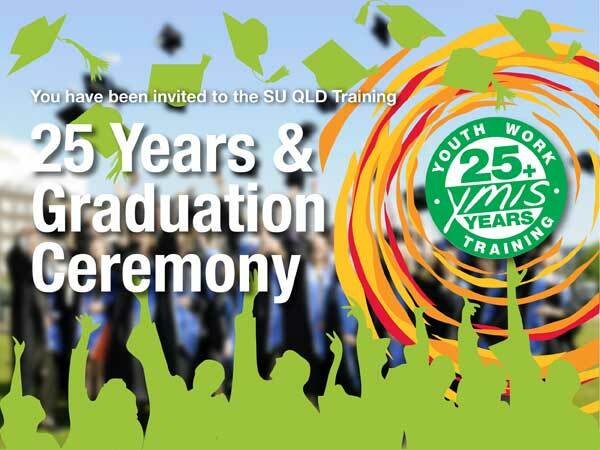 On Monday 12 December 2011, SU Qld will celebrate 25 Years of quality training for youth work and Ministry AND congratulate almost 150 graduating students. 25 years ago SU QLD embarked on a mission to invest in resourcing and equipping a new generation of youth workers. Spearheaded by Ross Farley, an internship program was developed that would provide a year-long, formal qualification primarily focussed on training for youth ministry. And so YMIS, the Youth Ministry Internship Scheme, was conceived and in 1987 the inaugural class of 9 students celebrated their graduation. Today the YMIS legacy continues. SU QLD is now a nationally-recognised training organisation with almost 200 students currently enrolled in our Certificate IV and Diploma of Youth Work programs. We invite our alumni of the past 25 years to join us in celebrating this journey. Students, lecturers, supervisors and staff will gather to reminisce our history, congratulate our 2011 graduates and share with you our vision and excitement about the future for SU QLD Training. There is no charge for this event. There will be an opportunity to support the work of SU QLD Training on the night.